It’s been an exceptionally difficult week for me. While Brendan Bjorn’s pressure sore has thankfully healed, the area remains red with thin skin and the cavity of the sore remains. We have been out of the house 4 times now since his sore healed about 2 weeks ago after it had kept him bedridden for over 4 1/2 months. This morning, I see a spot of the skin that is once again about to open back up. It can’t open back up…please…no. 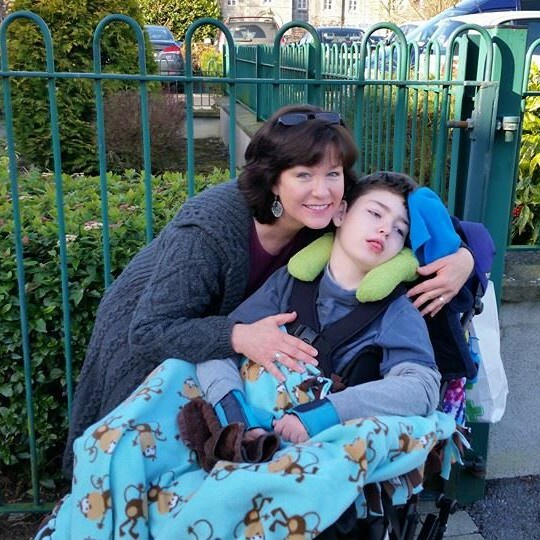 Declan has a follow-up haematology appointment next week in Dublin which will mean Brendan Bjorn must be in his wheelchair for at least 3 hours, and most likely that will end up being about 5 hours, if not more. This poses a real risk for the sore opening back up by the pressure of him sitting on it for so long. And my heart fills with worry. Brendan’s new battery operated, articulating shower trolley came last week. He won’t be able to use it until we move into a fully disability-suitable home. I just can’t carry him from one room to the other again. Last time I tried, I fell over backwards while he was in my arms, but fortunately his wheelchair caught me fall and he was unharmed. I gave him a bed bath yesterday and it just isn’t sufficient. I can’t rinse his beautiful thick hair fully, so it leaves him with residue that flakes off with his already dry scalp, despite the special shampoo. There is no sign of us getting the needed special housing Brendan requires. No sign, no word, no peace, no glimpse of security. And my heart feels hopeless. My youngest son is miserable, trapped in a house in an area he rightly feels afraid to even go for a walk in. He blames me, truth be told – and I accept my mistakes, my faults, and my failure to provide him a forever home in a good neighbourhood surrounded by friends. This week has been especially hard as he’s home on Easter break for 2 long weeks with boredom compounding the issues of isolation and unhappiness. And my heart knows he deserves so much better than I can give. I need to get in for a mammogram…still. It’s been put off for over a year now. As there still is no in-home respite (and with the loco parentis clause I wouldn’t be allowed to leave the nurse alone in the house anyway) it will just have to happen with Brendan in tow. I again have pain in one of my breasts. I mention this only because as full time carers, and I think especially as mothers, we tend to put our own health way down on the list of priorities, and we really should not do that! I am scared, yes, but can’t get lost in thoughts of what if. After all, there can’t be any what ifs when so much depends on you being healthy yourself. And my heart ignores the fear of what could happen. Tomorrow is Easter, a traditional day celebrating the resurrection of Christ. It is a day also traditionally filled with family and friends gatherings, laughter, happiness, and fun. And maybe a bit of church. The boys and I won’t be going to church. I need to keep Brendan’s sore from opening up before Declan’s medical appointment on Tuesday, so in bed he will stay until then. Anyway, I don’t believe in only showing up to church on Easter and Christmas. Hypocrisy at its finest, in my opinion. As for the family and friends gathering, it will be the 3 of us…me and my two precious sons…as always. Together, alone. I’ll make a special dinner which 2 of the 3 of us can eat. I’ll give Declan an Easter basket and likely raid half of the loot inside. And then, it will be a day like every other day. Lucky for me, I have these 2 boys who save my heart from shattering into a million tiny pieces when my world hurts so much. They deserve the world without any of the hurt. I feel your pain and loneliness in your writing and wish I could help in some way ease your burden. I know how hard it is to be a parent care giver for a severely disabled child. When my daughter’s health became so bad and she was dependent on the Bipap machine to help her breathe she had to stay in bed most of the day and we couldn’t leave the house much at all. We did have a nurse to help and an accessible shower to clean her properly. I am so grateful for all of those things. I wish you had that for you and your family. I pray for you because I know how much work it is and I couldn’t imagine doing it alone. You are the best mother any child could hope for. Hugs to you all.